You can have delicious Vietnamese rolls at home tonight. 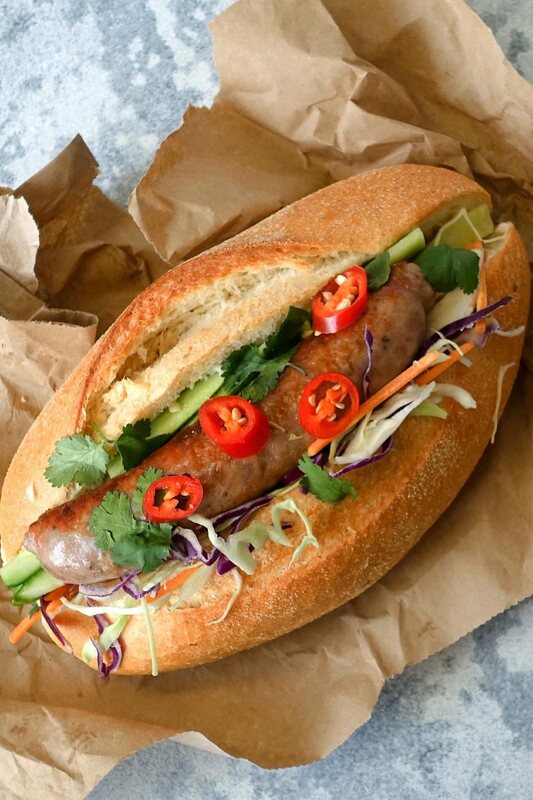 This easy Cheats Pork Banh Mi recipe takes just 20 minutes AND is totally yum! Heat a frying pan to medium heat. Place the sausages into the pan, and cook for 10 to 15 minutes, turning occasionally until they are brown on all sides. Meanwhile, mix the vinegar, salt and rice malt syrup/honey together in a bowl then add coleslaw mix and stir until coated. Set aside. Then chop the cucumber into batons, thinly slice the chilli and rinse and pick the coriander leaves, keeping an eye on the sausages as you go. Slice the rolls down the middle and spread the mayonnaise on each side. Place the coleslaw mix on one side of each roll and the cucumber batons on the other. When the sausages are cooked place them in the middle of each roll and top with coriander and chopped chilli.